On this marvellous tour you will discover ancient cultures; prehistoric monuments and standing stones; Norse (Viking) occupation; Orkney's important role during the World Wars; the site of Scotland's gold rush; abundant wildlife and much more. 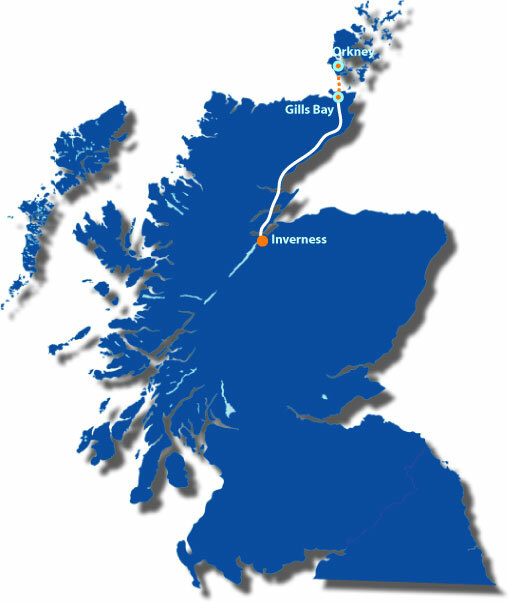 Departing from Inverness we cross the Moray Firth and drive through the Black Isle to the Cromarty and Dornoch Firths. Soon we will pass Dunrobin Castle, the grand home of the Earls and Duke of Sutherland. As we drive towards nearby Golspie you will see a statue of the First Duke on top of a nearby mountain. It was he who, enthusiastically, embraced the farming of sheep on his estate in the early 19thCentury which forced many tenants from their land. We'll hear more about the "Highland Clearances” as we drive northwards. We board the ferry for our crossing the Pentland Firth to the Orkney Islands. On our arrival it is a short drive to the famous and beautiful Italian Chapel. This ornate chapel was lovingly created by Italian prisoners of war from a simple metal hut and provides a moving legacy of World War 2. The sheltered water of Scapa Flow has witnessed major events during both World Wars as we shall hear as we make our way across the causeway towards Kirkwall, our home for the next two nights. Orkney is home to many outstanding historic treasures and today will be a unique day of discovery. On our itinerary are visits to Maeshowe*,a magnificent tomb built almost 5,000 years ago and the Ring of Brodgar, a stone circle that once comprised of 60 megaliths. The site is some 1,000 years older and three-times larger than the more famous circle at Stonehenge. The neolithic settlement of Skara Brae * lies near the dramatic white beach of the Bay of Skaill. Uncovered by a great storm in 1850 Skara Braeis the best preserved group of prehistoric houses in Western Europe and presents a remarkable picture of life around 5,000 years ago. During our optional visit we will get a vivid impression of the realities of a prehistoric village and see ancient homes fitted with stone beds, dressers and seats. Striking St Magnus Cathedral was founded in 1137 by the Viking, Earl Rognvald, in honour of his uncle St Magnus. Our last visit of the day will take us to explore Britain's most northerly Cathedral. It's an early start as we board the ferry and bid a fond farewell to the Orkney's. On our arrival on the mainland we make our way southwards towards Helmsdale which sits at the mouth of the River Helmsdale and is one of the best Salmon fishing rivers in Scotland. This area abounds in wildlife so look out for the seals as we cross the Dornoch and Cromarty Firths and way our way, once more, across the Black Isle. Enjoy the views of the Moray Firth as we cross the impressive Kessock Bridge and make our early-afternoon arrival in Inverness. • Full Scottish breakfast (days 2 & 3). • Live commentary in English.